A. I was listening to Arthur on a conference call with Conscious One and I was amazed at the sound coming out of this human being that I had never met. The depth of the vibration he was embodying made me feel like I already knew him. During this period as a professional speaker every time I went on the stage I experienced a 15 second burning sensation in my throat. I thought Arthur could help me to mechanically release this challenge because I dreaded those first 15 seconds as it always got in got in the way of my embodying joy at the beginning of my speeches. I contacted Arthur and began my work with him, thinking it would take one or two sessions. It took 25 years! (Of course I am being humorous.) However, it was indeed a journey…and what a joyous journey of discovery it was! I thought that I was merely going to release the mechanical difficulty I was having with my voice and not only did I do that, I was able to discover the nuances of my Inner Voice. I learned to have my outer voice match my Inner Voice and that was when I truly started to feel the significance of Who I Am. Although this sounds a bit esoteric, it has translated into success in business in a vast way. It has allowed my voice to connect with my Work (as Arthur of course says with a capital W) here on the planet as a woman walking this path at this time. It has allowed me to fearlessly, courageously and with a sense of Surrender, embody and emanate the depth of who I am and who I am becoming. As a business leader it has allowed me to express my voice magnetically. When it comes to business you could say, “Put your money where your Voice is,” and if you don’t have a magnetic and visceral Voice, guess what… you’ll stay stuck in lack! A. As I started to feel my voice blossoming, it was like a continuous unwrapping of this mysterious gift of my inner Self. I started to recognize that to empower my Self with the fullness of my Voice was not only not egotistical, it was the truth of who I am, and anything less than that would be ‘playing small.’ It was not about me seeking attention from others; it was about me paying attention to the depth of who I am and having the freedom to express it. This is a journey that is constantly evolving and it is letting me know every day that there is yet another level to who I am that I am tapping into and expressing through the vibration of my Voice. Another shift was when I stopped feeling tension whenever I opened my mouth and stopped feeling so self-conscious of what was about to come out, how it was going to sound, how it was going to be perceived. I am the closest I have ever been to the “message” and the “messenger” being in a joyous dance of harmony. A. It was the time I got on stage and I no longer had a burning sensation in my throat! And then it was the time after that when I got on the stage and I realized that not only was I not trying to please the audience, I was in a sense of full pleasure as a woman, a sense of sensuality that is not interested in what others think of me, that is interested in who I am becoming. Perhaps the next time was when I started to see that my audience, mostly women would look at me and say I want what she is. They wanted within themselves what they were observing that was unfolding within me, and that which I was now able to tap into. As a human being and as a woman who at this time is on her path, my most valuable asset is the freedom I feel around the power of my Voice, knowing that if I don’t have freedom around the power of my Voice, then I don’t have access to the depth of my power. 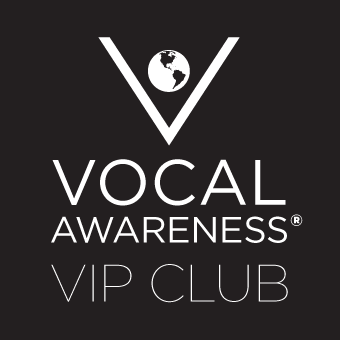 Vocal Awareness has given me the tools to bring my Self out of a perceived box of limitations. It has allowed me to joyously, harmoniously and prosperously own the vibration of a Voice that resides at the heart of my purpose.